Thanksgiving dinner is all about family. But, let’s be honest, it’s also all about the food. Thanksgiving is one of the few meals where we really focus on home cooking, rather than pre-made or purchased food items. But along with your home-cooked turkey, gravy, potatoes, and pie, will you be serving boring, store-bought bread? 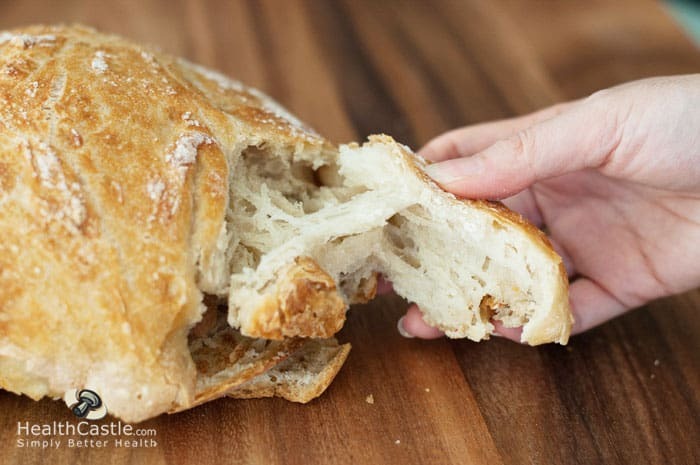 Even if you think you don’t have time to add one more item to your Thanksgiving to-do list, you can make this easy homemade bread recipe. It involves absolutely no kneading and just about zero effort. No-knead bread recipes took the Internet by storm way back in 2006, when The New York Times published a recipe adapted from one created by Jim Lahey at Sullivan Street Bakery. I first discovered the concept shortly before Christmas a couple of years ago, when I was looking for bread maker reviews. Someone had posted a comment on a review saying that there was no need for a bread maker if you use the no-knead bread recipe, since the process of making it takes virtually the same amount of work as using a machine. I had to check it out. The result? A beautiful, round, rustic-looking loaf with a crispy crust and soft inside. Delicious! And it’s made with only three ingredients! Here’s how to make it yourself. Combine all the ingredients in a large bowl. Mix with a wooden spoon just until everything is combined. Cover with plastic wrap and let sit for 12 to 20 hours. 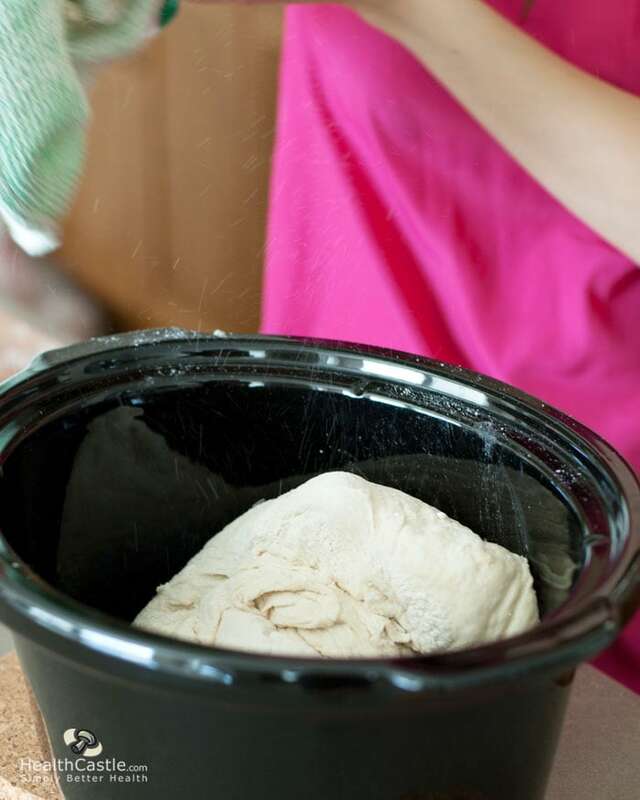 After 12 to 20 hours, your dough will smell like beer and appear bubbly. 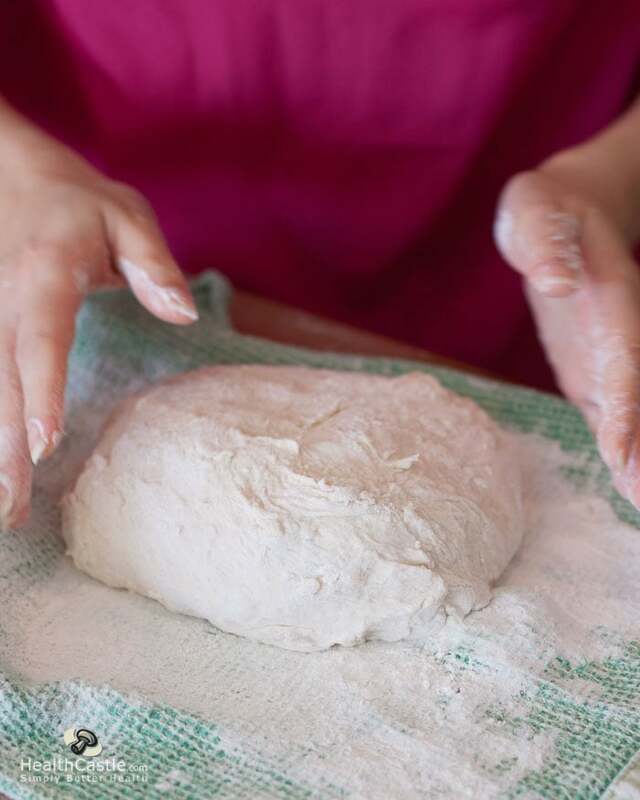 Using wet hands, place dough on a lightly floured surface. 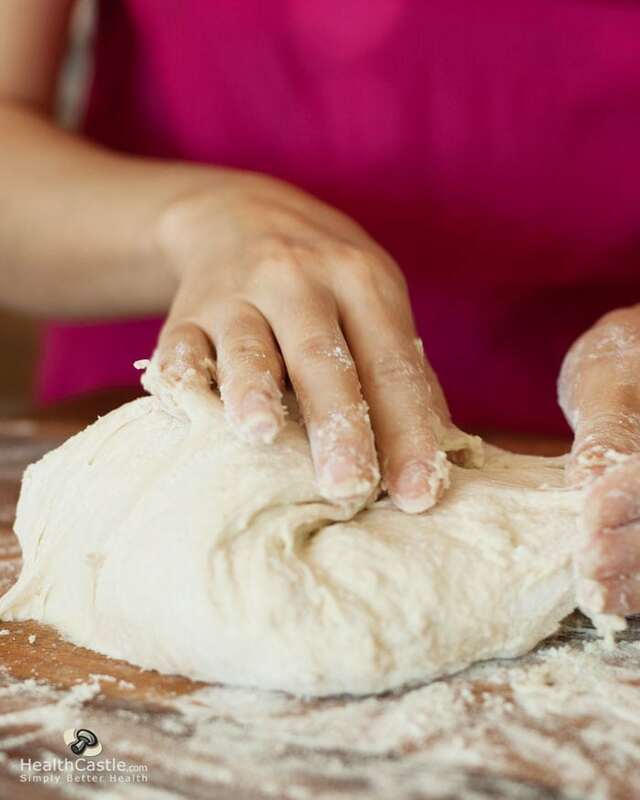 Fold the edges of the dough toward the middle and use your hands to shape the dough into a ball. Place the ball fold-side down on a floured tea towel. Sprinkle a little more flour on top of the dough ball and cover with another tea towel, or by folding the first tea towel in half. Let the dough sit for two hours. Half an hour before the second rise is finished, get ready by setting your oven to 450 degrees and putting your empty covered pot inside to heat up. See notes below on choosing a pot. Remove hot pot from the oven. Depending on the material of your pot, you may need to grease it with butter. This will make it easier when removing the finish bread. Pick up the towel holding the dough and dump the dough into the pot. Give the pot a gentle shake to even out the dough. It’s ok if it looks messy; it will even out once it’s baked. Place the covered pot back into the over for 30 minutes. Then, take the lid off the pot and cook uncovered for another 15 minutes. Remove bread from the oven and cool on a wire rack. I’ve been making this recipe regularly for a couple of years now, and have tried several modifications. My main variation has been experimenting with the flour. 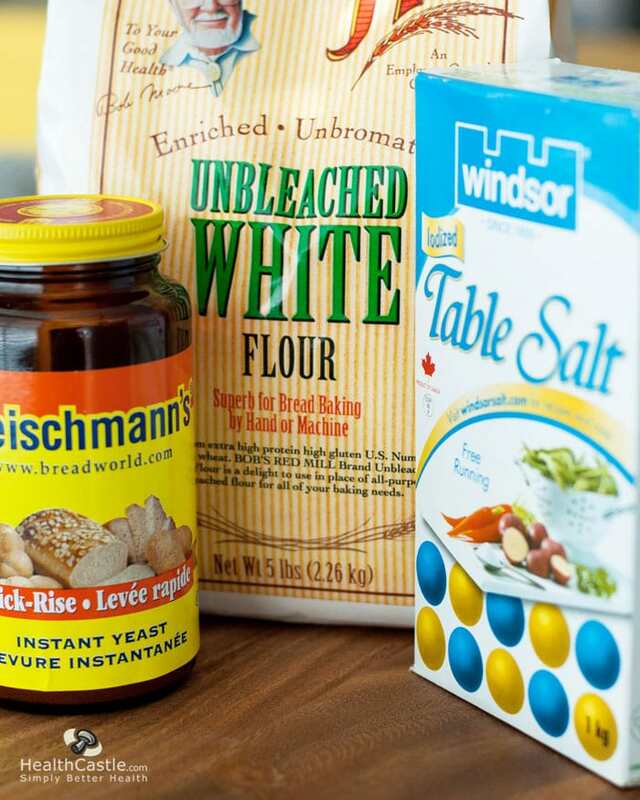 While white bread flour will give you the fluffiest loaf, you can get very good results with up to 2/3 whole wheat flour. When I use whole wheat, I add a bit of lemon juice to make the dough softer. If you’ve been making your own cheese and have leftover whey, you can use it in place of the water in this recipe. 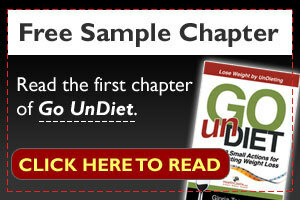 It gives the bread a hearty taste and adds some protein. If you want a taller loaf, you can place the dough inside a tall, narrow bowl or pot for the second rise. 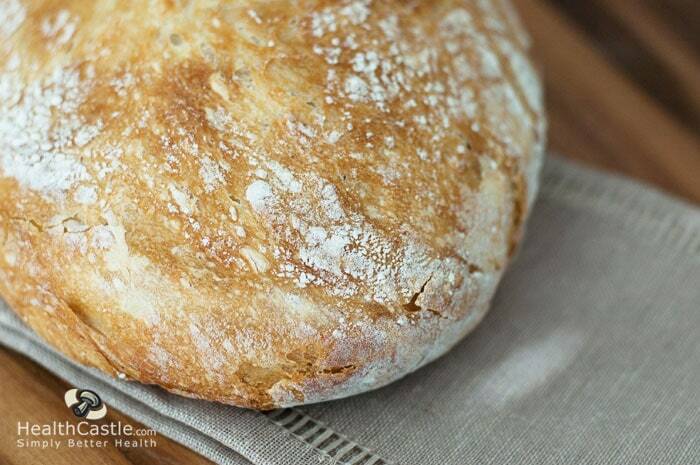 Nothing smells better than a loaf of homemade bread. With this recipe, you only need to put in 15 minutes or so of actual work to create a delicious loaf you can tailor to your own tastes and nutritional preferences. If you want to be really ambitious, serve it with homemade butter for an irresistible treat.